DIRECTIONS: Prince Books is on the corner of Main Street and Martin's Lane. 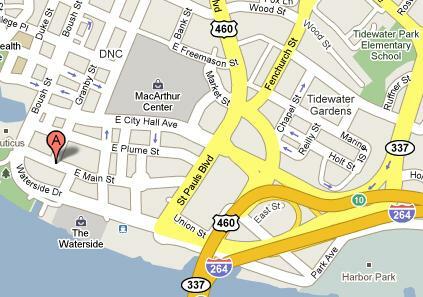 We are next to the Marriott Hotel and Convention Center (Martin's Lane runs between us). We are one block from Waterside. From I-264 (going west from Virginia Beach or going east from Portsmouth and Route 58): Take the Waterside Drive exit. The third stoplight is Martin's Lane. Turn right on Martin's Lane, which is a mere one block long. We are on the left on the corner with green awnings. From Hampton Boulevard/ODU area: Follow the signs on Hampton Blvd. south for downtown Norfolk, at which point Hampton Blvd. turns into Brambleton Ave in the area of Sentara Norfolk General Hospital. Follow Brambleton Ave. to Boush Street. Turn right onto Boush Street. Follow Boush Street to Main Street (Nauticus, the National Maritime Museum will be on your right). Turn left on Main Street. We are on the right with green awnings at the end of the long block. 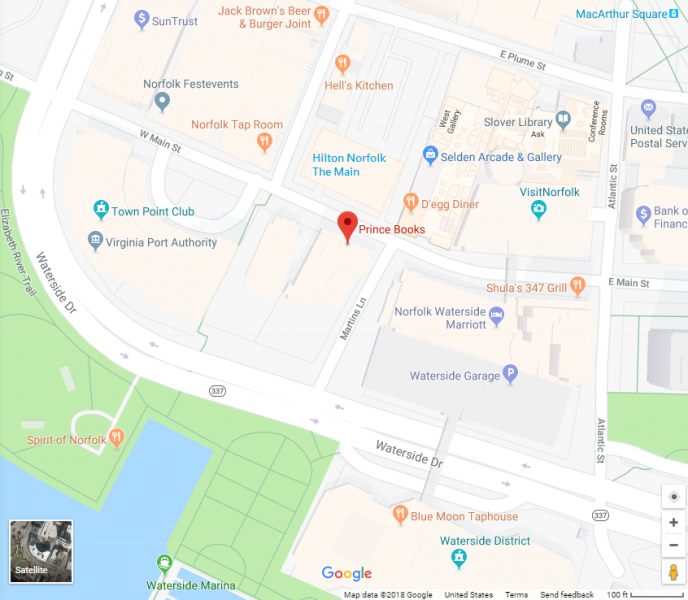 PARKING: Prince Books is located in the heart of downtown Norfolk; we have free parking when the bank is closed. TowneBank closes at 5 p.m. This means that you may park behind the store in the bank parking lot after 5 p.m. and all day on the weekends and banking holidays. UPDATE: TowneBank is graciously allowing our customers to park in their parking lot while shopping at Prince Books when the bank is open. Just tell the parking attendants, Craig and Johnny, that you are going into Prince Books.